On Saturday, October 24, I attended and age a short talk at an excellent event in Oxford called Spectral Landscapes: Explorations of the English 'Eerie'. It showcased the work of Adam Scovell and three short films (in the end) were shown, including Adam's newest, Salthouse Marshes, and his collaboration with Robert Macfarlane, Holloway. I was fortunate enough to be invited to give one of the talks, along with Justin Hopper, Sharron Kraus (who also gave a performance), Katy Soar, George Bickers, and Eddie Proctor. It was a highly enjoyable evening and built upon the Alchemical Landscapes conference in Cambridge that was held back in March (see previous post). 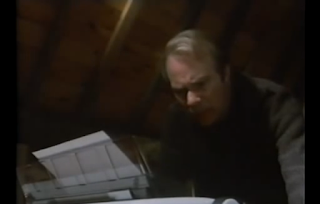 I gave a talk about Alan Garner and in particular his 1980 teleplay To Kill A King. (It's available on YouTube - well worth a watch.) Here is the script. In this talk I’ll be considering To Kill A King, a half-hour BBC tv teleplay broadcast in 1980 as part of ‘Leap in the Dark’, a series of uncanny tales. To Kill A King was written as an original screenplay by Alan Garner, and is a narrative of a blocked writer and what seems to be his muse, filmed around Garner’s property in Cheshire, which resides next to the Jodrell Bank radio telescopes. The opening shot of the teleplay shows a train passing through the countryside – grey, wintry, dark – on an elevated railway embankment. As it passes out of shot, the camera rests momentarily on the main Lovell telescope, before panning and refocusing on the house in the foreground, in which we can see a woman in a window. This is the ‘muse’. In voice-over, we hear the voice of Harry, the writer (Anthony Bate), who awakens to find that a message is ‘already coming’. The visual connection between the train, the landscape and the radio telescope, which is then further connected to an act of poetic transmission, rehearses the visual fabric of Red Shift, the BBC tv adaptation of Garner’s earlier novel which was directed by John Mackenzie (The Long Good Friday) in 1978. Red Shift connects landscape with a mythic conception of history and recurrence, in which the presence of a stone axe-head (a ‘thunderstone’) links three distinct eras: the first century AD, the period of the English Civil War, and the ‘present day’. Images of transportation (the M6, Crewe railway station), mass communication (tv, headphones) and place (in particular Mow Cop in Cheshire) indicate a deep vertical relation in Garner’s work between place and time which is revealed through acts of transmission, in place but across time. Under my ground is the ancient, the old world of magic and ritual, of weirdstones and thunderstones, that keep the world in balance. The house, cows and summer. Not much shows but that. Than houses and night than winter. The line is not to London. More by winter than by all the year. And a night to kill a king is this night. It also returns directly to To Kill A King, as the last line of this poem is the last line that Harry, upon waking, hears and transcribes. Harry takes dictation, but the lines heard as a female voice-over are not the ones he sets down on the page. When he shows the new work to his long-suffering agent, what is revealed is either Joycean glossolalia or a kind of invocation, a ritual spell: ‘It is not a piss-one, or a tin-pot to pick with you, my lad…’ it begins. Just as the Jodrell Bank telescopes ‘listen’ to the universe, a sky full of radio transmissions, Harry attends to the words ‘coming in’. The gap between transmission and transcription causes Harry to have something close to a breakdown. What we have here is then a poetic of transmission, a model of poetic creation that Tom McCarthy, in his International Necronautical Society documents, outlines as central to 20th century poetics, from automatic writing to Rilke’s Sonnets to Orpheus to Cocteau’s Orphée. In To Kill A King, this is emphasised by the increasing dominance of communications equipment within the visual compositions: a reel-to-reel tape machine; disembodied telephone messages; a typewriter that begins to print on its own; and finally television broadcasts, in which Harry is trapped inside the screen of a tv, one that appears in shot directly behind him. Is Harry a creator, a writer struggling to write and suffering mental anguish as a result? Or is he a receiver, human communications equipment that no longer functions properly? Harry ‘escapes’ this dilemma by smashing the tv screen with a rock, a stone face that he plucks then throws back, horrified, into a pond in a walk through the winter landscape. This object, like a thunderstone, connects him directly to ritual and to place, and his ‘release’ is an act of symbolic and purgative violence, destroying his connection to the communications technologies of modernity and his fear of being ‘switched off’. In the last shot of the play, Harry assumes the place in a chair in which the female muse had been sitting. This can be read as a kind of fusing, in which Harry (e)merges as a writer once more, both receiver and transmitter, listener and creator. The conception of artist as receiver, a poetic of transmissions, is crucial to Garner’s work and, I would argue, the figuration of the Spectral Landscape. In the forging of a creative connection between times, listening to transmissions of place and making these into new forms, new artworks, the artist or writer or film-maker (e)merges as a conduit between landscape, time and the broadcasting sky. No, not sf, but a response to a review of Das Boot recently written by my old friend John Bleasdale. 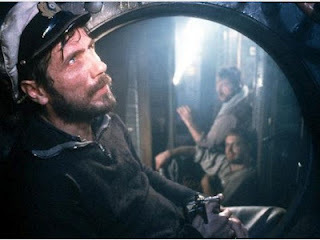 John’s thesis is that Das Boot’s male homosociality unconsciously repeats the forms of warrior masculinity and sociality that can be found at the roots of fascism, a politics the film ostensibly disavows. John’s piece begs the question: can a film be made about war that does not glorify it in some sense, and thereby fall into the very thing it criticises? Afterwords from B4 films on Vimeo.